In order to improve the facilities at the eastern end of the Pentland Firth, the RNLI decided in 1877 to place a lifeboat at Huna. The locals agreed to contribute towards the estimated cost of £1100.00 for the lifeboat and boathouse and to support the maintenance of the station. The lifeboat was gifted anonymously to the RNLI by grateful parents in memory of a child whose life was saved on August 6th 1873. At their request it was named W.M.C. It was a standard 34 feet long and 8 ft 3 in. broad, 10 oared self-righting built by Woolfe at a cost of £363. 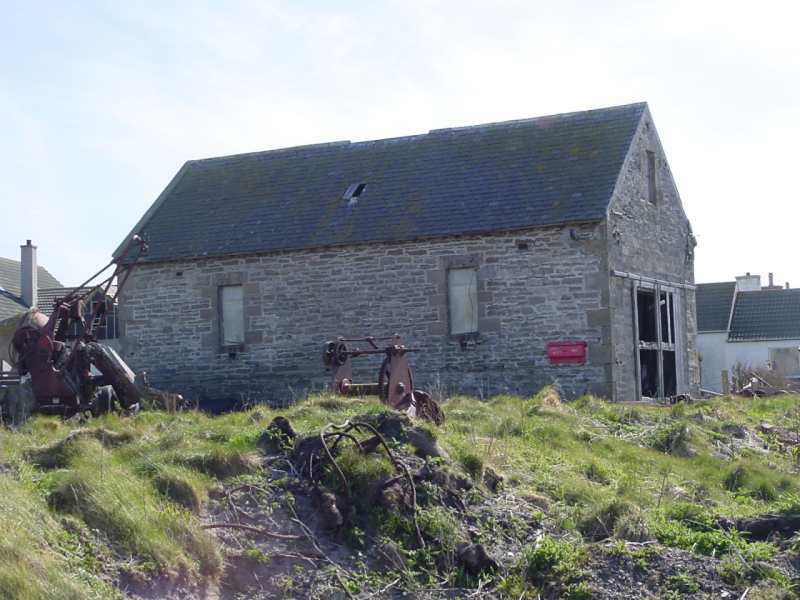 The first boathouse was built by J Charleson for £252.00, but its site is uncertain. On the morning of 10th January 1893 the fishing fleet had set out from Wick for the winter fishing off Noss Head – the weather being pleasant and the water smooth. The fishing vessel Margaret Gunn WK304 with Skipper Maclean and a crew of six had set four nets and were working lines off Freswick when a violent southerly gale placed the vessel in danger. With great difficulty the nets were recovered, the sails were reefed in and efforts were made to get under the shelter of the land. After a short distance, the mast broke and together with the sail, was swept overboard. However it was made fast by ropes to the stem. The fishing boat WK 1107 skippered by John Robertson went to their aid, but was unable to make fast the ropes which were thrown and the disabled boat was swept past Duncansby Head and into the Firth at the mercy of the winds and waves. The danger was considerably increased by the mast in the water bumping against the stern and several leaks sprang. In spite of many difficulties and with constant baling, Gills’ Bay was reached about 7p.m. Two anchors were cast overboard, but the Margaret Gunn started dragging towards the shore. In answer to the distress flares, Huna lifeboat was quickly manned and launched. By skilful handling under the coxswain John Calder, it went alongside and rescued the crew of seven and landed them at Huna. Shortly afterwards the Margaret Gunn was driven ashore and smashed to pieces on the rocks. At 8.30am on the 8th August 1883 the 362 ton Norwegian barque Minerva of Langesund (Captain Gundersen) went ashore on the Pentland Skerries. She had left Garston Dock, Liverpool, just over a week before with a cargo of salt for Viburg in Finland. All had gone well until Dunnet Head was reached, but there the steering way was lost due to the direction of the wind, and the vessel was swept by the tide through the Firth and on to the Skerries. When the Minerva struck, Huna lifeboat was launched and together with several Stroma boats was quickly on the scene. By that time, however, the damaged leaking vessel had been dislodged from the rocks by the waves and tide, and sank in a short time on the south side of the main island. The crew of nine were able to launch the ship’s lifeboat and with the assistance of the lighthouse keepers, land on the rocks. Huna lifeboat under her coxswains Messrs Calder and Dunnett, recovered the crew and their immediate belongings from the Skerries and landed them on the mainland. In November 1889 the W.M.C. was replaced by the Caroline & Thomas. The new lifeboat was self- righting, 37 feet long, 8 feet broad, 12 oared and cost £495.00. She was bought with a legacy from Mr T Hackwood of Sydenham. In 1890 the present boathouse was built for £988.00. The slipway, 343 feet long, was constructed by Sinclair & Banks for £724.00. Special rollers were later added at a cost of £100.00. A winch was also placed on a concrete base in a filed at the rear of the boathouse. On 1st May 1900 the Swedish barque Hans of Landscrona, 1200 tons, with a cargo of rosin worth £4000.00, lost her rudder, wheel and sails in a strong north westerly gale near Dunnet Head. Lifeboats from Thurso (coxs. Brims) and Longhope (coxs. John Swanson) pursued her as she was driven eastwards through the Firth. Huna lifeboat was taken from its shed but was damaged in the launching and had to be recalled. Ackergill was made ready but was not launched. When clear of Duncansby Head the twelve members of the crew of the Hans were taken aboard the steam liner Celtic after abandoning ship. Two days later Wick lifeboat was launched when the abandoned Hans was driven ashore at Broadhaven. Its cargo was recovered but the vessel became a total loss. In September 1901 the Caroline & Thomas was replaced by the Ida. She was self-righting, 37 feet long, 9 feet 3 inches broad, ten oared and cost £903.00. She was provided by the legacy of Miss Ida B Sutherland of Hove. At 3am on the 29 November 1902 the steam trawler Silanion GK2279 of Grimsby ran ashore east of the John O’Groats Hotel. The night was intensely dark, there was a strong south easterly gale and a heavy land surf was running. When the distress signals were seen from the shore, the lifeboat under coxswain J Dunnet was hurriedly manned, launched and proceeded towards the stranded vessel. In the meantime the crew of the trawler had launched their own boat, but this was swept away in the heavy seas. Captain Smith who had been staying at John O’Groats, made his way over the rocks and shouted to the shipwrecked crew to wait for the lifeboat. By means of a lantern he was able to guide the lifeboat to the scene as by then the Silanion’s lights had failed. With great skill and determination the lifeboat was taken against the lee quarter and the crew of ten hauled aboard. Because of the heavy seas running the lifeboat had to wait for daylight before attempting to land at Huna. Even then it was not possible and she proceeded with the rescued crew to the harbour at Mey. The Silanion belonged to the Standard Steam Fishing Co. of Grimsby and commanded by William Wright. She had been fishing near the Faroe Islands and was on her way home with a catch worth £400.00. The vessel was two years old and cost £6000.00. Early on 8th April 1902 during hazy weather the Glasgow trawler Ardgowan GW4 ran on to the rocks about half a mile from John O’Groats. After being fast for three hours, the crew were able to refloat her on the rising tide. Before, however, the vessel could get under way a rapid current caught her and she was swept on to the Ness of Duncansby in a dangerous position. Meantime the Huna lifeboat was alerted and quickly launched. The crew of nine and the captain’s son were transferred to the lifeboat and landed at Huna. The Ardgowan was later refloated and towed to Wick for repairs. On 25th May 1910 while the fishing vessel Stratheyre of Findochty, BF493 and skipper Alexander Campbell, was proceeding through the Pentland Firth on passage from Stornoway to Stronsay when the wind fell away and she was swept by the strong tide on to the Skerries. Shortly afterwards she broke up and sank leaving the crew clinging to a rough raft of spars and buoys floundering in the water. At considerable danger to himself, James MacHardy, one of the assistant lighthouse keepers, swam out and made a line fast to the raft which was then drawn to shore by the other lighthouse keepers. Huna lifeboat had been alerted when the incident occurred but the men were ashore by the time the lifeboat arrived. The crew were recovered from the Skerries by the lifeboat and taken to Huna. The Stratheyre was valued at £440,000 and the gear at £350.00 – all was lost.